There are some things that take you right back to being a kid again. 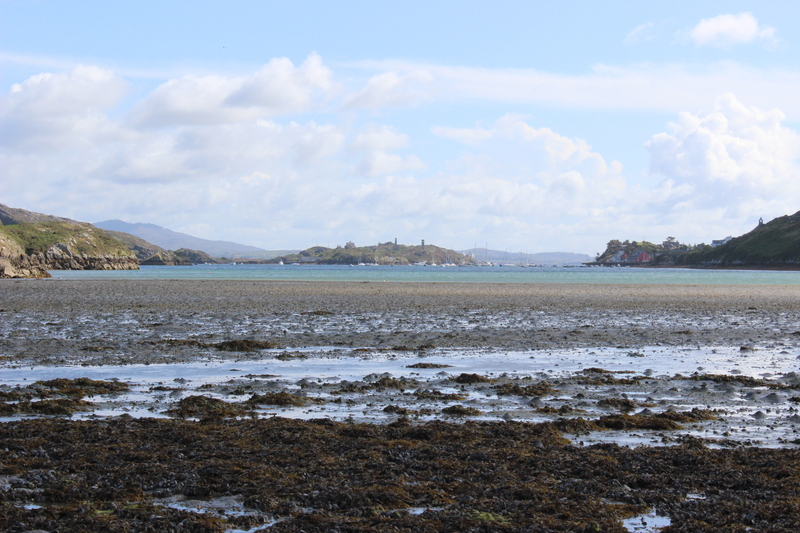 Mussel picking is one of those adventures that as a kid I thought was just so exciting, sunny beachy days waiting for the tide to go out so you could pluck the best ones off the rocks. 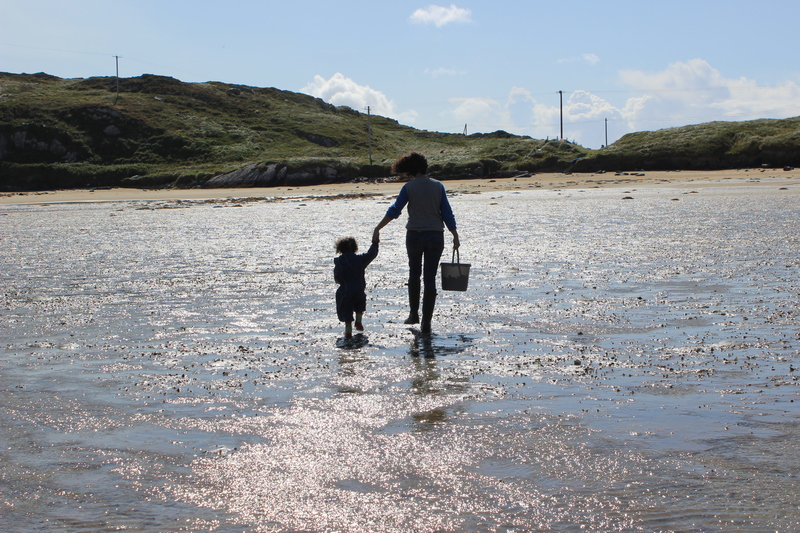 This summer I decided this was something I wanted to do with my daughter and seeing as we were in prime mussel position in West Cork that’s just what we did. Buckets, waterproofs and wellies at the ready we set off with my friend Leanne to bring home the dinner. Now I won’t lie, the picture perfect day out was slightly marred by the fact that it was blowing a hoolie and at first my daughter Tilda held on to me like a limpet on a rock and had no intention of getting into the mucky seaweed. I thought this might turn out to be a disaster but suddenly the fun of the wind, muddy sand and the excitement of choosing which mussels to pick got the better of her. We found the most amazing giant fat mussels on the rocks and in huge clumps under the sea weed and they pulled away really easily. After an hour of getting our feet suckered into the squelching sand and sea weed and Tilda wiping out a few times in the wind we had a pretty full bucket, which in retrospect was a little optimistic seeing as dinner was for 5 people. So now it was just a short walk home to start scraping the mussels. This is where my mum took the reigns and got to work making Moules Mariniere. This is my favourite way to serve mussels, tomato and chilli bases and even thai are also good but I like a good traditional mariniere. 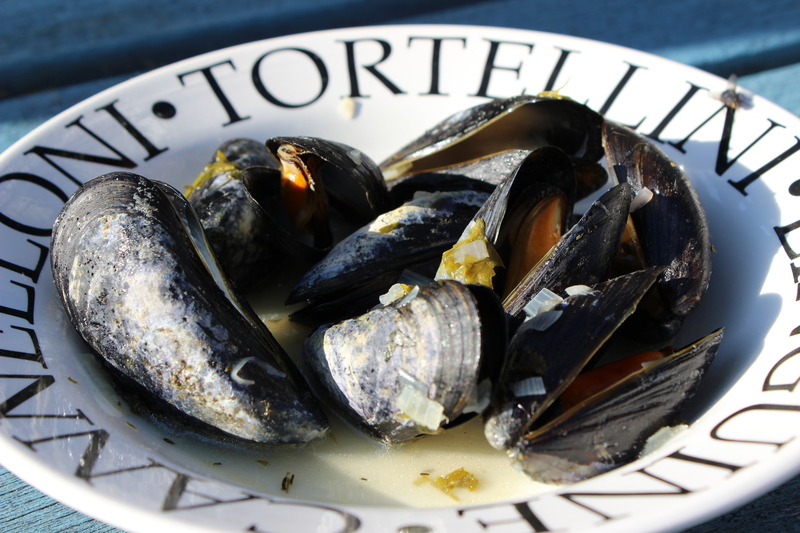 Soften the garlic and shallots in the butter in a large deep pan on a medium heat – it should only be half full once all the mussels are in. Pop the mussels in along with the wine. Turn up the heat and cover the pan. Steam them open in their own juices for 3-4 minutes. Give them a stir to turn them over every now and then. Add the cream and chopped parsley and give them a stir, take the pan off the heat. So there we go, it’s quite a lot of effort but it’s a great day out particularly for kids and incredibly satisfying when you sit down to something that you have not only cooked but foraged for. Even if I do say so myself they were absolutely gorgeous. Stick it on your bucket list! P.S. Some people say that you should only pick mussels in months that include an ‘r’ but we did this in August and the mussels were fat and wonderful. I guess we have global warming to thank for that! 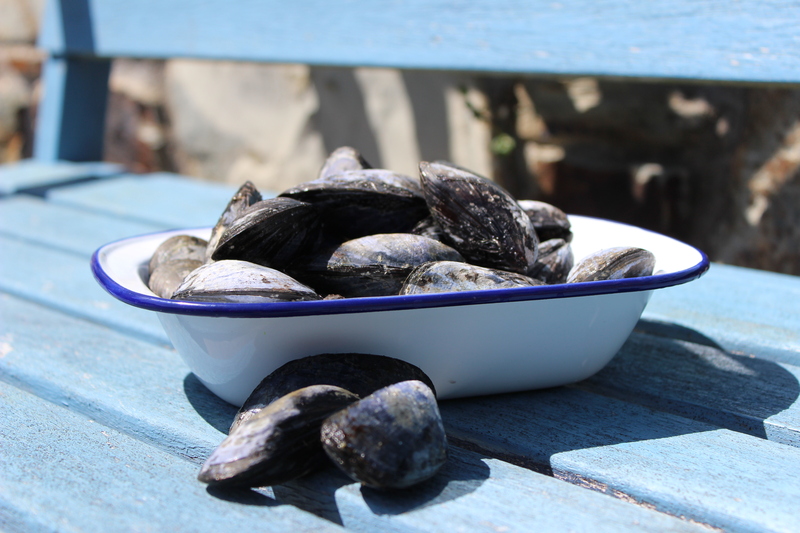 What a fantastic activity, I remember doing a lot of fruit picking but never mussels! I LOVE mussels as well, we have a mussel restaurant here in Newcastle called “the Big Mussel” and they serve massive bowls of them ………… you’ve actually just made me realise I haven’t been for ages!